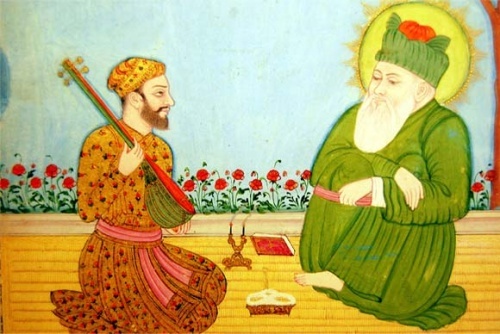 This week's Maitri Tunes is the spontaneously beautiful and soul-stirring poem that the "Father of Qawwali" Amir Khusrow wrote to his mother to describe his meeting with his beloved teacher, Nizamuddin Auliya. There is a heart-warming story told of the immense dedication and surrender of Amir Khusro towards his teacher. Nizamuddin Auliya had thousands of disciples. Out of them, 22 were totally devoted disciples who considered him as God Incarnate. One day, Hazrat Nizamuddin Auliya thought of putting them to a test. He roamed around with his disciples for the whole day in the market of Delhi. As night fell, he went to a brothel. The prostitute led him upstairs with great respect and courtesy. All the disciples were waiting downstairs in anticipation, '"Our teacher should be coming down soon, he should be coming soon." The prostitute was immensely pleased and wondered as to what stroke of fortune had brought this saintly person to her place. She said to Auliya, "I have been blessed by your presence here. In what way, may I render service to you?" Auliya told her, "Instruct your maid to bring food on a platter along with water in a liquor bottle, in such a manner that my disciples get the impression that I have asked for food and liquor." The prostitute had but to obey the command. She instructed her maid accordingly. After a little while, the maid carried the food and the liquor bottle upstairs as per the instructions. Some of the disciples contemplated, "We were under a mistaken impression. Our teacher is not the saint we thought him to be all along. He has asked for liquor!" Thinking thus, some of the disciples went away. As the night progressed, more and more of his disciples left one by one. Finally, it was dawn, and Auliya came downstairs. He saw only Amir Khusro waiting for him. Feigning ignorance, he enquired, "Where have the others gone?" Amir Khusro replied, "All have left." Auliya asked, "Why did you not leave? Didn't you notice that I had asked for liquor, and spent the whole night with the prostitute." Amir Khusro replied, "O Master! I might have left, but where could I have gone except towards your lotus feet?" Benign Grace poured out of Nizamuddin Auliya's heart, and he said, "Your wait is now over. You are accomplished." Such was the single pointed faith of Amir Khusro. Even to this day, the shrine of Amir Khusro beside that of Nizamuddin Auliya reminds us of a sincere disciple's devotion to Guru, a disciple's unshakable faith in Guru. Here is a another beautiful Maitri Tunes, "Kun Faya Kun" from our archive sung at the shrine of Nizamuddin Auliya in Delhi. Aaj rung hai hey maan rung hai ri. I have found my pir Nizamuddin Aulia. And finally this face has enchanted my heart. Never seen a glow like this before. What a glow, Oh, what a glow.